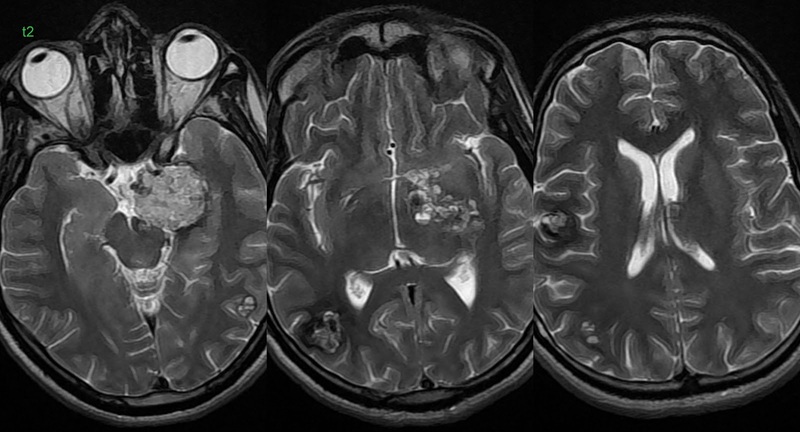 A 40 yo male presented with sudden onset paraplegia. 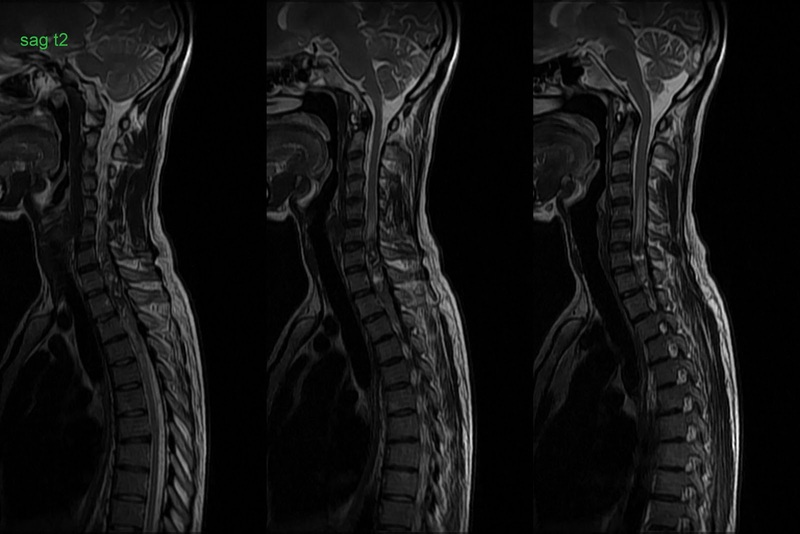 MRI Spine done first revealed an intra medullary focal lesion with T1 bright meth Hb staining and low signal intensity hemosiderin staining on GRE. 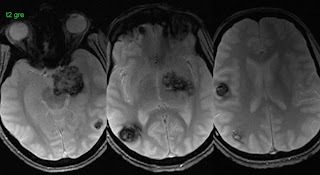 Brain screening done in same setting revealed multiple similar intra cranial lesions. 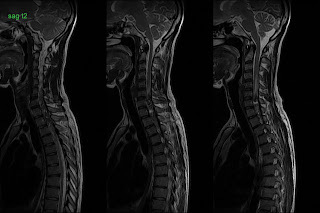 MRI brain and spine images of same patient. MRI Brain shows multiple intra axial focal lesions with typical pop corn ball appearance on T2w images with low signal intensity hemosiderin rim. Few T1 bright locules of meth Hb - a sub acute stage blood degradation product. Lesion show low signal intensity blooming on T2*GRE. No mass effect. 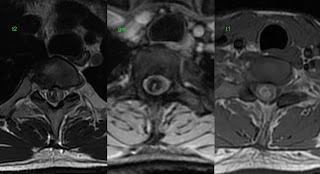 MRI Spine shows a similar intra medullary focal lesion at the level of C7, marked adjacent cord odema. 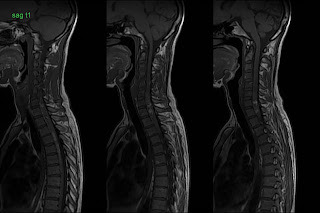 Diagnosis: Multiple Brain and a Spinal Cavernous Malformation. A benign vascular hamartoma, composed of closely packed immature blood vessels with intra lesional micro hemorrhages, without any neuronal tissue. Best diagnostic clue is "Pop corn ball" like appearance with hemosiderin rim on T2w images. Occur anywhere in brain. Rare in Spinal cord. Vary in size from few mms to cms. Average size is between 1 to 5cm. Usually single solitary, may be multiple, discrete lesions. 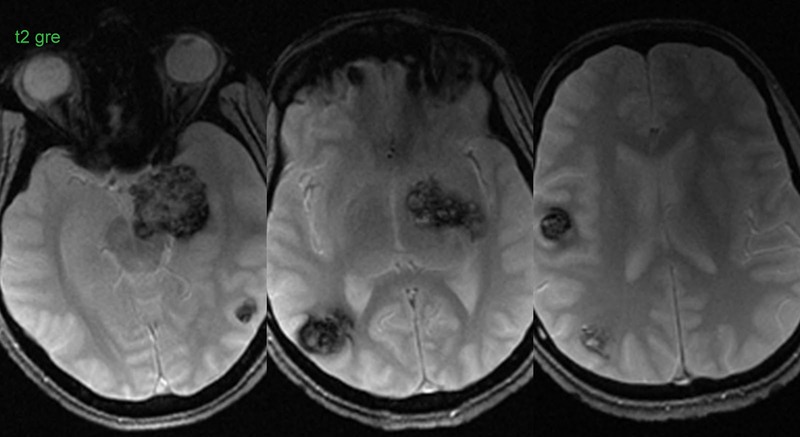 MRI is more sensitive and specific for detection of lesion. Hyper dense on non contrast CT. Calcification seen in ~ 50% cases. No to faint enhancement on post contrast. 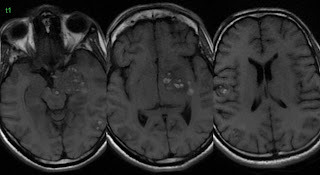 On MRI lobulated appearance due to multiple locules which show variable signals, depending up on the blood degradation products. T1 bright locules attributed to Meth Hb - a sub acute stage blood degradation product. Low signal intensity hemosiderin rim on T2 images. Low signal intensity blooming on T2*GRE images. No to faint enhancement on post contrast T1 images. No to mild peri lesional odema. Asymptomatic 20%, detected as an incidnetal finding. No intervention is a rule. 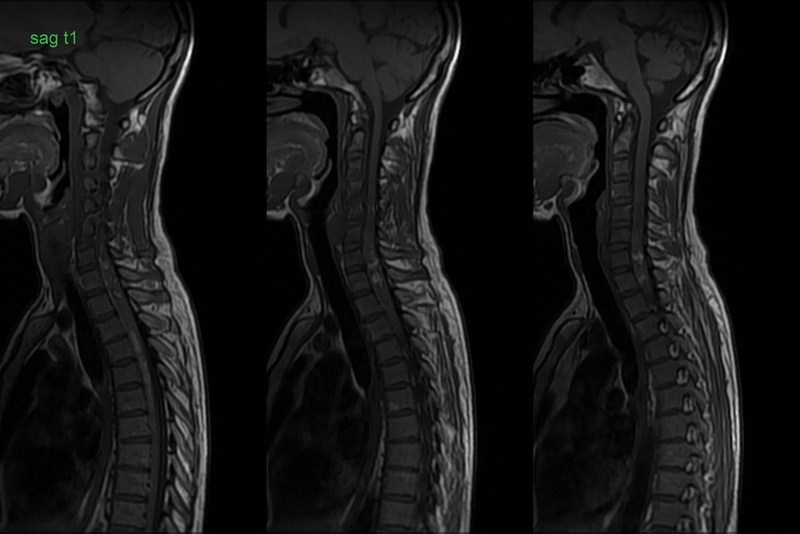 But need follow up imaging as it may show progression or regression in size. Rarely show massive bleed. Can affect any age group. Familial association in Hispanic Americans - Multiple Cavernoma Syndrome, carries higher risk for bleed and re bleed.